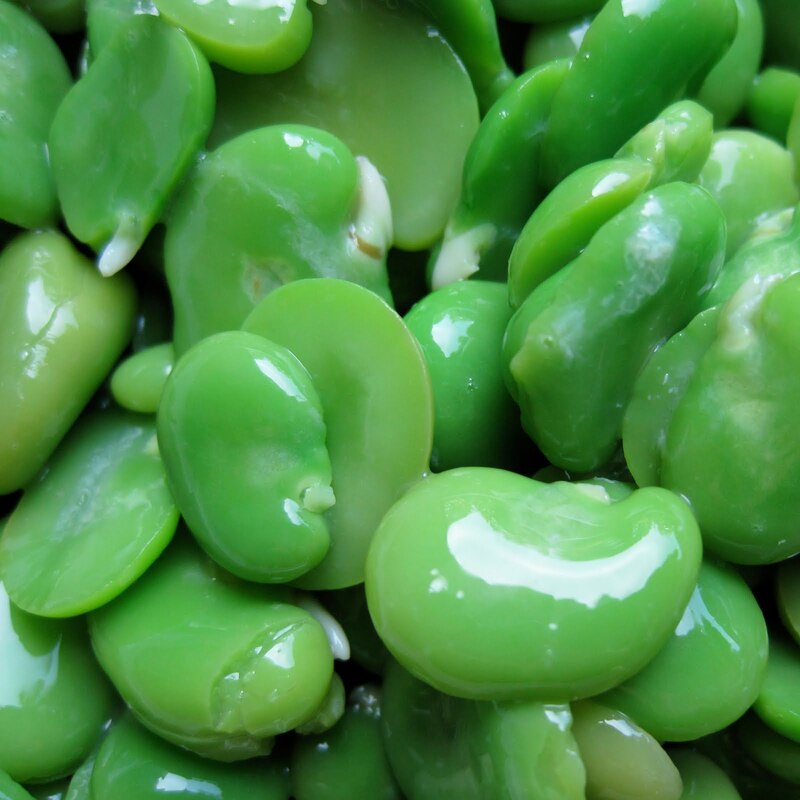 Fava beans are a special spring treat, but very labor intensive. 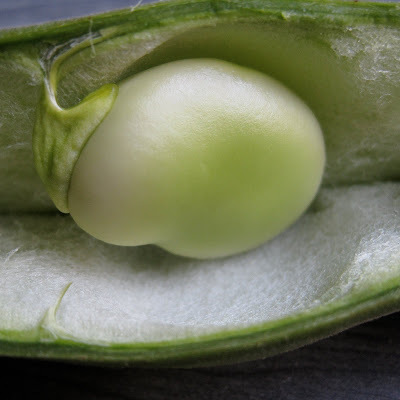 They need to be removed from their pods and blanched ... then each individual bean needs to be peeled. It's not difficult, but it is time consuming. Simple instructions here and a great set of step-by-step photos here. After peeling the beans, which took about 90 minutes, we were left with 1.7 pounds of beans. Now you understand why they are considered a delicacy! This dish is assembled from two recipes; details below. Bake the potatoes, wrapped in foil, for ~ 1 hour in a 400 degree oven. Peel and pass through a potato ricer . Let potatoes cool for ~15 minutes then mix in flour a few tablespoons at a time until the dough is formed; it should not be sticky or crumbly. 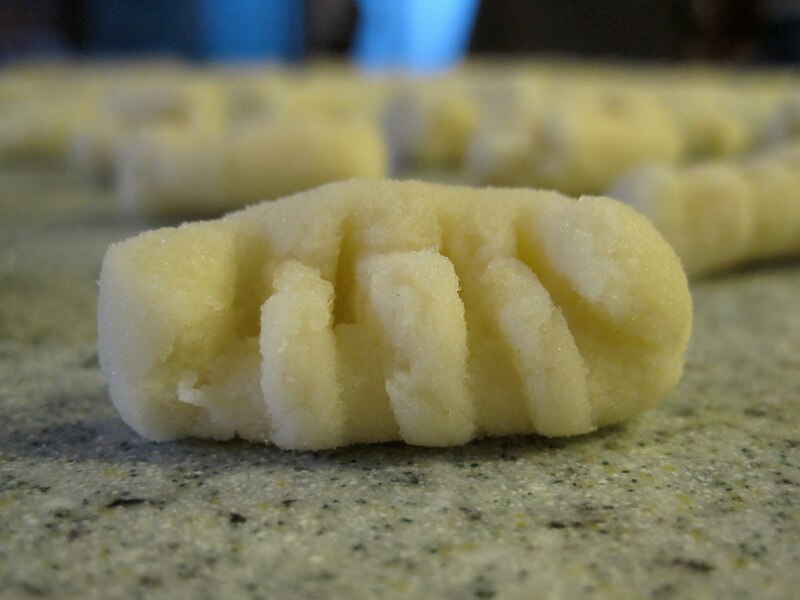 In sections, roll the dough into "ropes" about as thick as your thumb. Cut each rope into 1/2" pieces, smaller is better than larger. With the back of a fork, roll each gnocchi to create ridges for the holding sauce. Add favas, garlic, rosemary, and olive oil to a sauce pan. Add enough water to barely cover the beans. Simmer until the beans are tender, about 5 minutes. Finish with lemon juice. Adapted from "Gnocchi with Thyme Vinaigrette and Lemon Cashew Creme" on Vegan Yum Yum and "Fava Bean Ragout" from Chez Panisse Vegetables. While the ragout is simmering, heat olive oil in a sauce pan over medium-high heat. Saute the gnocchi till golden brown. 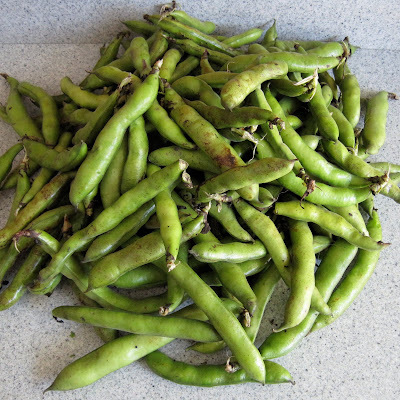 Season with salt and pepper, then serve topped with the fava bean ragout. Purée all ingredients in a food processor then season with salt and pepper to taste. Serve with toasted or grilled bread, such as pugliese. We ate the strawberries out of hand today. The collards, rapini, and spinach will be chopped and stirred into whatever we make this week for some added veggies. We'll hold the carrots for general use and the calcot onions will be grilled next weekend.